I have always loved Sandwiches. I don’t actually remember since when. But these always made a dull morning very bright and an evening to look forward. I have always wanted to try out as many different fillings to go between those slices, no matter what. I love cheese stuffing and including other interesting ingredients with this makes it more interesting. When my nephew and nieces visited us, I was specially asked for a sandwich breakfast, especially with cheese and paneer. So it was. I made them in sandwich maker, which really gives a cool look and makes it very crispy. I made the tomato sauce for the spread for some, grated cheese. The other alternative fillings were curried potatoes, paneer, Plain cheese with green chilies, Cheese slices, Mixed Fruit Jam etc. Before I could even think of taking pictures, those disappeared. But I knew I would be making those again since Konda loves sandwiches. This time round I make some more fillings to go with. Mash boiled potato well. Heat oil in a non- stick pan, add the potatoes, add all the spices, mix well. remove and allow it to cool. Saute everything in oil over medium flame till the onions are brown. Grated Cheese with finely chopped Green chilies. Same as onions, add the grated paneer along. Make a paste of the mint leaves. Saute it along with the above potato stuffing. In the sandwich maker, grease both sides. Fill the bread with the stuffing, grease the sides with ghee/ butter and cook it. Then if you want cheese over it, spread the filling on the slices, top it with grated cheese and then grill it. It takes about 3-4 mins for the sandwiches to get done. Though these normally tastes good to be served right away, you can always send these for your Kid’s snacks which might be earlier than lunch. My kids enjoyed all the fillings, except the chili ones which I made for the elders at home. Do share other fillings that you make. All the sandwich options look delicious.Will try them soon. all fillings in one page. Curried paneer is new to me. Thanks for sharing. I make a filling by sauteing onions, green chillies, bell pepper/capsicum, tomatoes. Add garam masala, Garnish with cilantro and put them between the bread and toast in sandwich maker. The other one is just use any left over chutney as a base, slice cucumbers, tomatoes and cover with another piece of bread. This one is a raw sandwich. No need to toast at all. I have never tried paneer stuffing. Looks good. love the simplicity in it- just what one needs on a busy morning! Simple and delicious snack and lunch idea for my kids. Thanks for sharing. 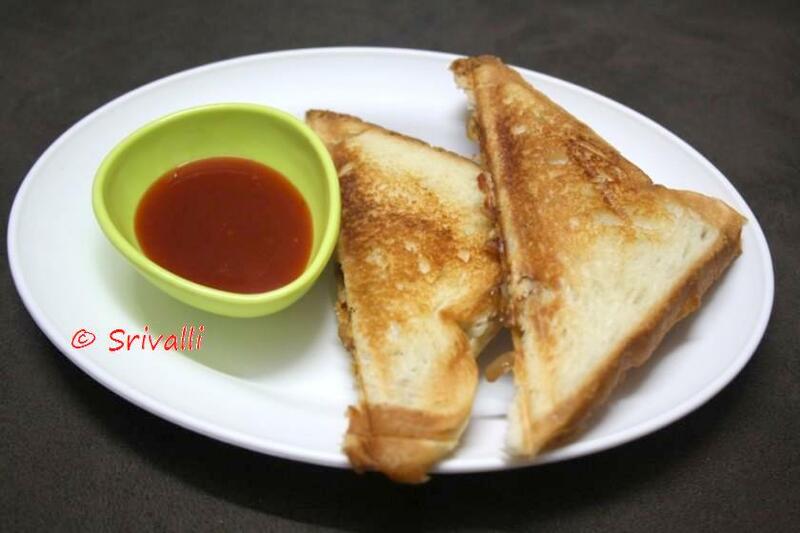 Love this simple and delicious sandwich, yummy..
You have a wonderful recipe collections. Lovely sandwich ideas. First time visit, following you.